Peterson holiday blend in my no name meerschaum apple. tiltjlp Dark Horse, in my '78 Pete 307 Silver Spigot. Been a while since I last smoked this, and boy howdy is it a mouthful! having some McC's bulk 2010 Classic Virginia in another Charatan 4651X Banker, this one a Belvedere series in a relief grain, This blend/mixture is growing on me the more I smoke it !! My favorite combo: McClelland Beacon in a Calabresi Canadian with a strong cup of black coffee. Dunbar, in the silver capped and appointed Peterson, shown with my newly acquired Forge De Laguiole Pipe knife and my vintage St Dupont Lighter. Right now... a change of pace for a Thanksgiving blend, Royal Yacht. Just right for sub-freezing fumatory pursuits. Full Virginia Flake in a slight bend 1968 group 4S Dunhill Shell 475 cherrywood. GLP gaslight in my Piersel blasted billiard. A bowl of McC's bulk 2010 in a GBD Virgin 789 pot w/ Perspex sb stem. Carter Cake (Carter Hall and 5100) in a MM General. McClelland #5100 Red Cake in a 1979 large calabash briar 221-B Baker Street made in Israel. My usual P&W #78 after supper. In my Mastro Poker. Next up is some Night Train. Could be the Tinsky '12 Xmas 'doggy or my trusty Wiley Rhody. GLP Montgomery in a red billard Gasparini on a quite rainy afternoon. Atmosphere couldn't be more right. Kentucky Planter in my old reliable 1986 smooth Peterson Kildare 999 Rhodesian. 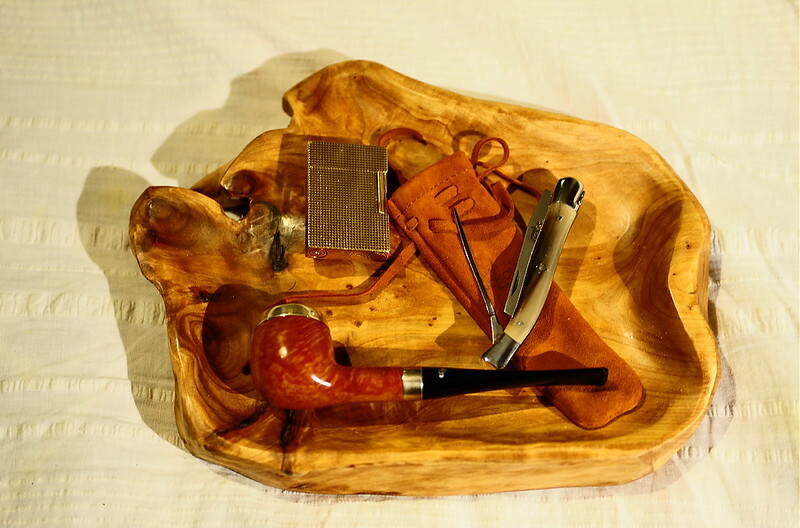 Boswell's CountrySide in a Savinelli Duca Eraldo. Carter Hall in a Medico Apple. Wow, it's really late here. Finishing up my last bowl -- G.L. Pease Jack Knife Plug, in a Dunhill Root Briar EK panel billiard. Nitecap in a Upshall Canadian, cup of hot black coffee, cold outside stood on porch while my Catahoula PMon made his steaming logs and then hurriedly ran to get inside .